As we celebrate Black History Month, I am excited to share an interesting discovery that came to light recently in the PHS archives. PHS archivist Bill Brock, while reviewing a box of reel-to-reel audio tapes, noticed one that was marked “MLK Speech at Charlotte.” After listening to the tape, researching related records at PHS, and checking archival resources on the Internet, Bill learned that the tape was indeed of Dr. Martin Luther King, Jr. The reel-to-reel tape contained a speech by King given on September 21, 1966 at a rally in the Hartley-Woods Gymnasium at Johnson C. Smith University, Charlotte, North Carolina. King’s address that night in Charlotte was sponsored by the Synod of Catawba Commission on Religion and Race in cooperation with the National Commission on Religion and Race of the United Presbyterian Church in the U.S.A. Prominent African American Presbyterians were present at that event, including historian Dr. Gayraud S. Wilmore, Dr. Reginald A. Hawkins, and Hosea Williams. King notes that this “spiritual and moral lag” manifests itself in the continuing problems of racial injustice and poverty throughout the nation. Both must be dealt with if we are to survive and grow. King describes two images of America: one defined by beauty and prosperity and the other scarred by poverty and oppression where more than 22 million African Americans find themselves unemployed, underemployed, and living in substandard housing. Forty-five years after his assassination, Dr. King’s words ring as true today as they did on that night in Charlotte so many years ago. 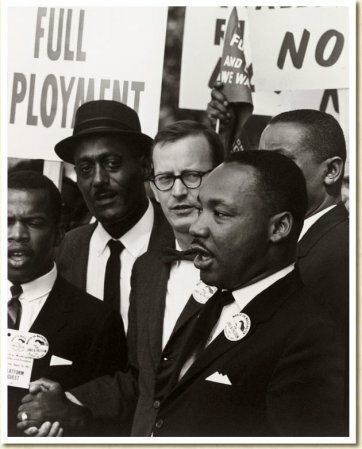 Learn more about Presbyterian involvement in the Civil Rights movement in this exhibit.